Cactusplant.co.uk Turbinicarpus & other Cacti Mexican minatures, Cactus cultivation. My name is Philip Andrews and I live in the South East of England. Having collected Cacti since 1961 I now have approaching 1000 plants in my collection. 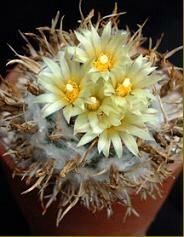 I have a particular interest in the Mexican miniatures such as Turbinicarpus, Ariocarpus, Aztekium, Astrophytum etc. ideal as they are small and slow growing and will not fill up the greenhouse. My very first plant was purchased when I was six years old and it cost me 2s-6d (12.5p). 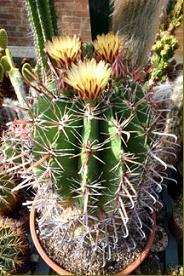 The plant was 'Ferocactus herrerae' it was in a 50mm pot and the size of a golf ball. Forty two years on the plant is in a 375mm pot and the size of a football. It is still growing well as you can see (pictured right). My collection is housed in an aluminium greenhouse measuring approx. 2.8x4.5m. The plants are supported on a single level of timber slatted staging positioned to give maximum light to those plants requiring it and some shade to others.